Hillary Chybinski: creative juices. . .
. . .i lifted carla's photo frame idea. 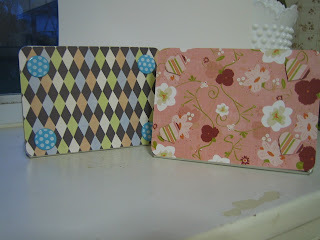 . .
if you haven't been to her blog and seen the cute frame from the Target $1 spot that she altered - go now. . . i'll wait. . . so here is my take - one for me and one for my friend pam (who has 2 little girls). These look great! Look at you all that scrapping and crafting with Little Mr. No Sleep underfoot!